"With the latest information technology advancement in Hong Kong Health Care industry, Hong Kong Adventist Hospital has to follow this new trend and made similar advancement. Safety, speed and accuracy are of the essence. "Healthcare workers need rapid access to patient information, medical records and resources as well as patient self access information electronically. Wit h the Information Technology advancement, Health Care providers can offer optimum patient care, while reducing the risk of human errors through the latest wireless technology. "In view of this, Hong Kong Adventist Hospital has Paediatric Unit & Integrated Unit as its first pilot nursing floor to implement such information technology advancement. Ms Gladys HO, Unit Manager for Paediatric Unit, Integrated Unit and Haemodialysis Center from Hong Kong Adventist Hospital would share her experiences as the pilot nursing floor at the planning stage for nursing practices. She would also share how she handles the associated changes on different stages; negotiates with the contactors and installation; collaborates with various departments within the Hospital, etc. " Bio: Ms Gladys Ho graduated from University of Toronto with Bachelor of Nursing on 1995; then moved back to Hong Kong after graduation. 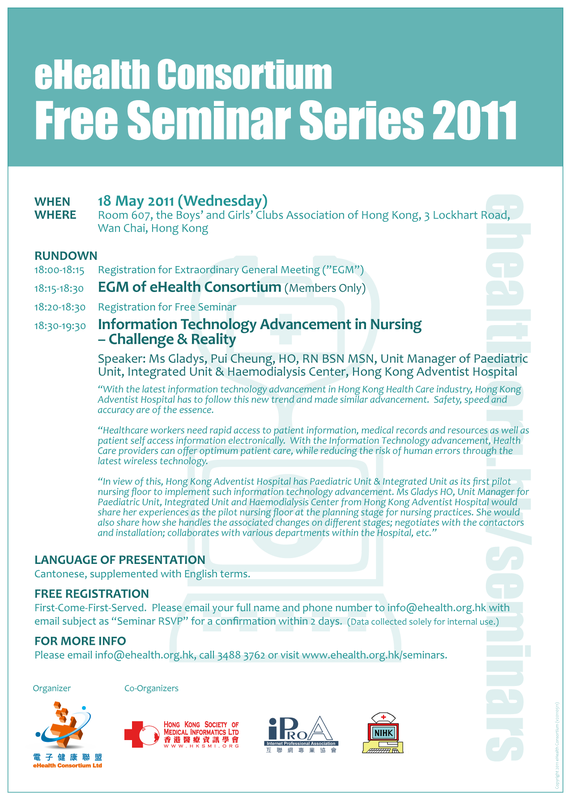 She worked in Hong Kong Adventist Hospital on various nursing departments since then. On 2006, she has completed her Master of Nursing Degree in Polytechnic University. She is now serving as Unit Manager for Paediatric Unit, Integrated Unit and Haemodialysis Center. Cantonese, supplemented with English terms. Thank you for attending the seminar. Please click here to download the presentation file in PDF format (828KB).